the Thing – Benjamin J. Grimm was bombarded by cosmic rays in a space exploration flight, alongside three friends. The cosmic rays gave each of them different powers, and they formed the Fantastic Four. Ben underwent the most physical change of the foursome: his skin mutated into orange rock and, as a result, he gained super-strength. Scarecrow – The Scarecrow is a magical entity that resides with a painting of a laughing scarecrow owned by Jess Duncan. He is the guardian of an interdimensional doorway that materializes through the afore-mentioned painting. His main purpose is to keep the demon, Kalumai, from corporealizing on Earth through the doorway. The scarecrow seems impervious to all harm (except for fire) and is silent (aside from his haunting laughter). In later years, he’s become known as the Straw Man, in an effort to differentiate him from the villain named Scarecrow. The Thing accompanies his girlfriend, Alicia Masters, to a gallery opening hosted by Jess Ducan. At the event, Jess and his girlfriend, Harmony Maxwell, attempt to convince the Thing that a heroic Scarecrow watches over them (events seen in Dead of Night #11 and Marvel Spotlight #26). Despite all he’s seen in his life as a super-powered adventurer, Ben Grimm doesn’t buy their story of a vigilant spirit that emerges from a painting. He doesn’t buy it, that is, until the Scarecrow emerges to take on a spirit sent to Earth by Kalumai. And, while the Scarecrow takes on Kalumai’s minion, Jess Duncan reveals to the Thing that the Scarecrow is a guardian, keeping the demon Kalumai from coming to Earth. The Thing acts upon this new knowledge and joins the Scarecrow in defeating the golden-skinned minion. This story takes place within Jess Duncan’s art gallery in SoHo. 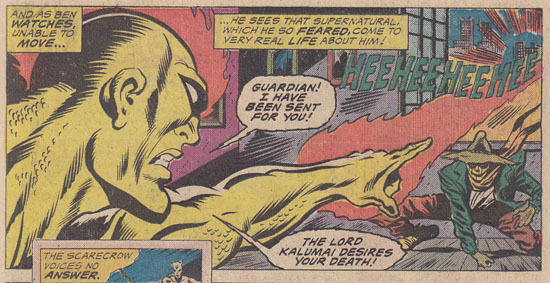 Kalumai is destroyed by the Scarecrow in a flashback sequence from Doctor Strange, Sorcerer Supreme #31 & 32. WHY is Scarecrow the guest-lead? This Scarecrow debuted in the final issue of Dead of Night (#11; cover date: August 1975). His second appearance followed months later in Marvel Spotlight #26 (cover date: February 1976). These two stories were initially going to be issues #1 & 2 of a Scarecrow solo title that never got going. It seems that the character wasn’t popular enough to maintain his own feature so concluding his story in an issue of Marvel Two-In-One was an easy way for Marvel to finish his story and ensure that the book would sell. After a few lame issues, this one seems to put the title back on track. First off, we’re treated to several pages of the Thing being grumpy since he’s been dragged to an art exhibit. And, he only gets more ornery when Jess and Harmony try to convince him of the Scarecrow’s existence. I really like that even though he’s faced down many alien and scientific threats, the Thing still isn’t comfortable with supernatural entities or events. It kind of makes a strange bit of sense. Seeing as how this issue serves to wrap up some loose plotlines from the previous two Scarecrow stories, I was impressed that the Thing’s involvement wasn’t minimalized. In fact, he got plenty of limelight in this issue. And, even better, it was “characterization” limelight – not just “clobberin’ time” limelight (which can be fun, too – don’t get me wrong). And, while it resolves some of the Scarecrow’s tale (which was left as “to be continued … someday” in Mavel Spotlight #26), it serves to advance it, as well. 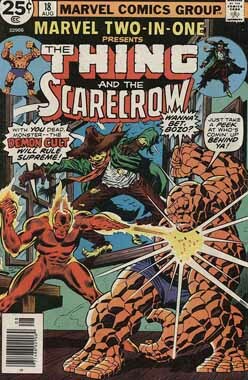 Unfortunately, the mysteries and questions raised of the Scarecrow mythos in this issue were never answered. BUT, that’s a problem for Scarecrow followers (of which there probably aren’t many anymore since the character has languished in obscurity) … not Marvel Two-In-One fans. Note: This issue’s letters column features commentary on Marvel Two-In-One #15. Additionally, this comic includes Marvel Value Stamp [Series B] #3 (part of the Captain America puzzle).